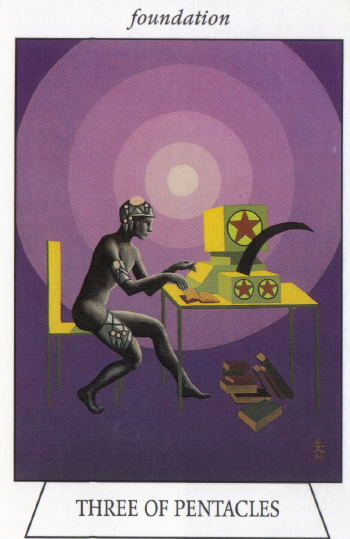 This card has such a modern vibe, the artisan working not at the stones of some ancient cathedral but at a computer, at a desk; the tools are not grand but compact - a little box, circuitry, a kind of modern magic, toss it in your bag and go. And yet it holds so much, doesn't it, allows you to do so much. Labor of love, working at that computer, creating, learning, studying, reading until your eyeballs hurt; of love perhaps, but a labor nonetheless. Labor that needs foundation for focus, for sticking to it. The suit of pentacles is earthy...what is needed now, for this to work, is not the ideas, not the inspiration, the creative drive; no what is needed is concrete focus, wellness, comfort, a safe place (that rich, purple color; the spirals of light - growing brighter, or dimmer?) to settle into - physically and especially mentally. Needing to harness the energy of the King of Wands not just to DO, but also to NOT DO. Time to get a grip on certain self-destructive tendencies of mine that have been given far too much free reign as of late. Everything has a price, consequences. If you are unwilling, at this time, to make the big, Tower-sized changes, then at the very least...restriction, carefully harnessing of resources to create at least that much stability, foundation, needed to focus on those things that matter most. Good call on the cards, Bonkers. 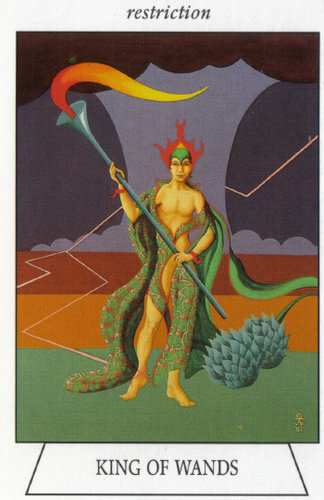 I also see the King of Wands as a sort of Nike person (the brand, not the goddess lol! ( - he's very much a Just Dooooooooo it sort of a person.